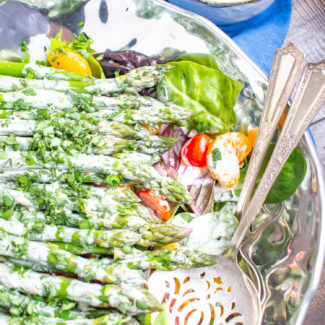 This easy to prepare Asparagus Salad is bursting with fresh flavors. 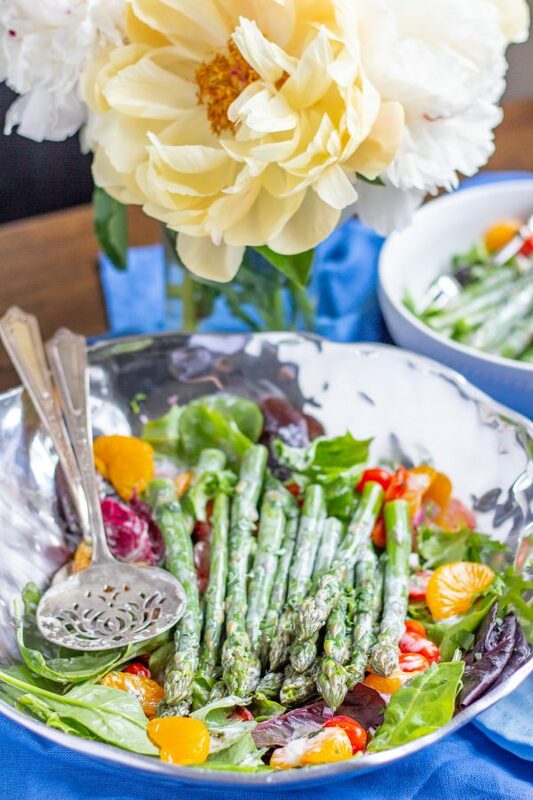 Cooked asparagus, grape tomatoes, mandarin oranges, and red onion are placed on top of mixed greens and then drizzled with a light lemon tarragon yogurt dressing. Serve it as a side dish, or add chicken or salmon to turn it into a complete meal. 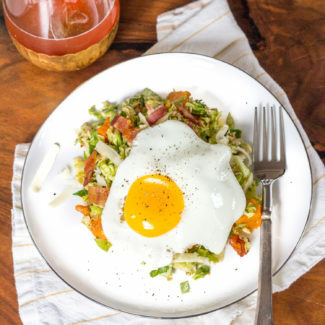 I love this recipe because it is a healthy meal that I feel good about eating. It is loaded with fresh vegetables, and the dressing is made with non-fat Greek yogurt to lighten it up. 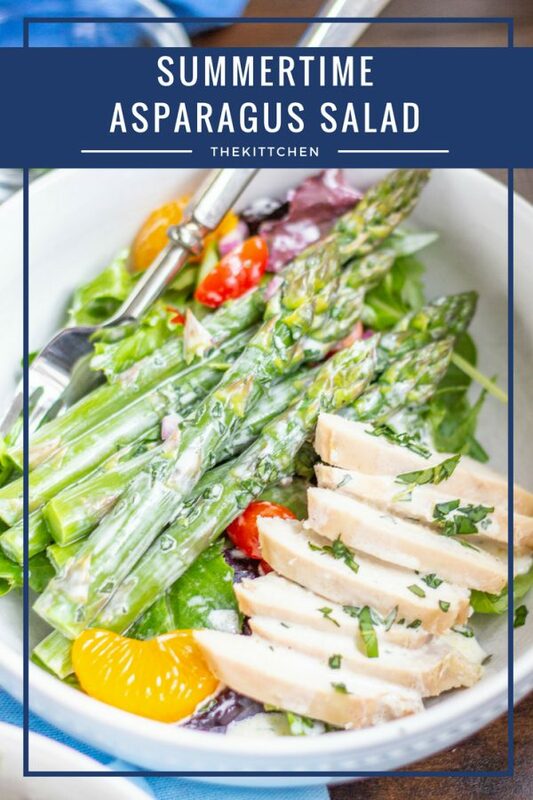 This asparagus salad can be made in just 15 minutes, and it is easy to scale the recipe to make a bigger batch. This recipe is based on one of my mother’s recipes. 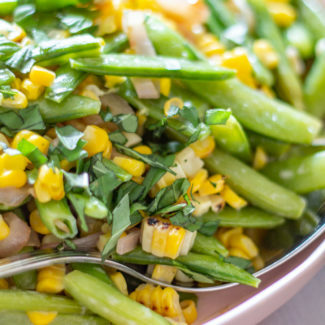 I first heard of the recipe recently when my sister referred to “Mom’s asparagus salad recipe that everyone loves”. I had no idea what she was talking about. Since I am the oldest child I moved out first, and since I live the farthest away I don’t go home as often. Sometimes I am so out of the loop! And I have never had this salad at my parents house – but I am so thrilled that my sister send me the recipe. I made a few adjustments to my mother’s recipe to make this salad a bit healthier. The original recipe is made with a mayonnaise based dressing. I used half mayonnaise and half non-fat Greek yogurt. And I added a touch of lemon juice to give the salad a fresher flavor. 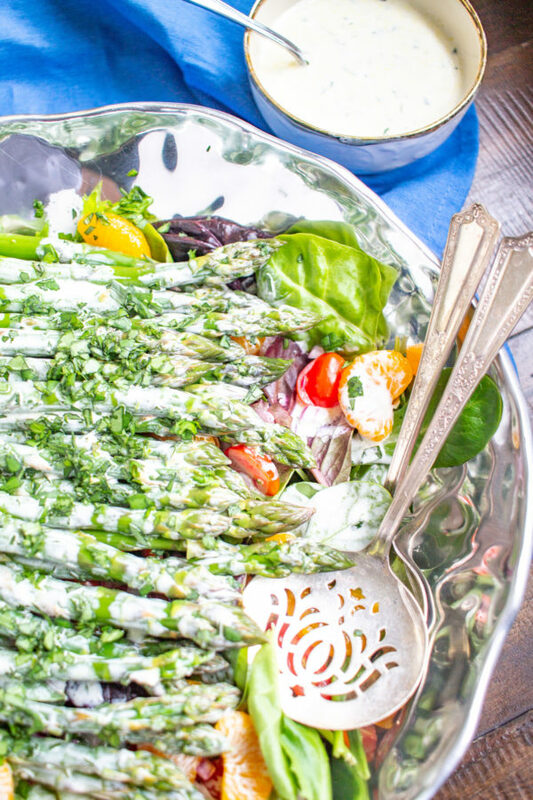 To prepare the salad, the asparagus is quickly cooked in boiling salt water and then put into an ice bath so that it maintains its bright green color. If you want to give the asparagus an extra burst of flavor you can roast in the oven with a touch of butter, lemon, and salt. 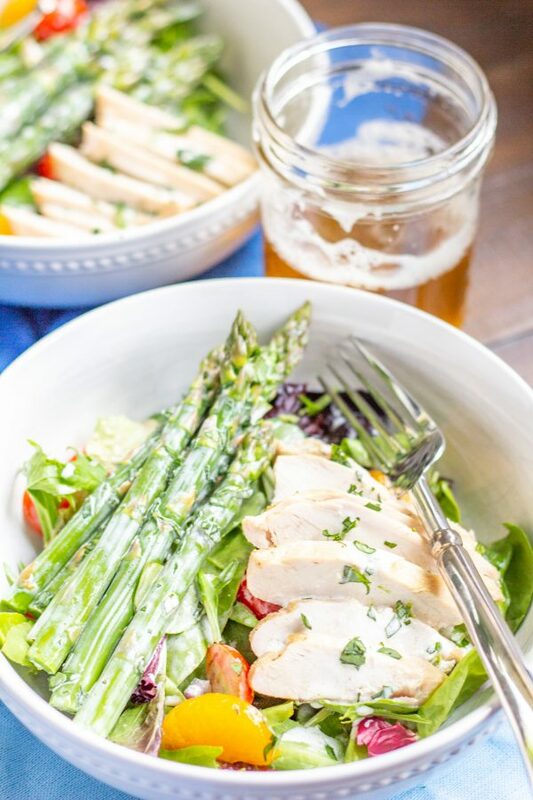 In order to turn this Asparagus Salad into a complete meal, I added some chicken. If I don’t have some protein at dinner I don’t feel full for very long. Roasted chicken breast paired well with the salad and the dressing. You could also try adding some salmon. 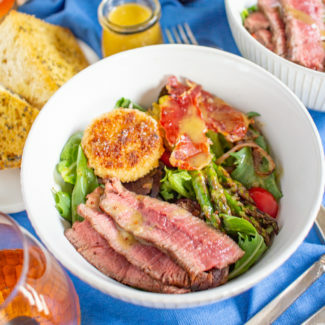 Some other delicious additions to this salad would be slivered almonds or crispy bacon. 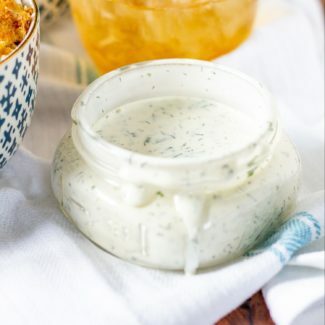 To prepare the dressing, combine all the ingredients in a bowl and whisk to combine. Chill. 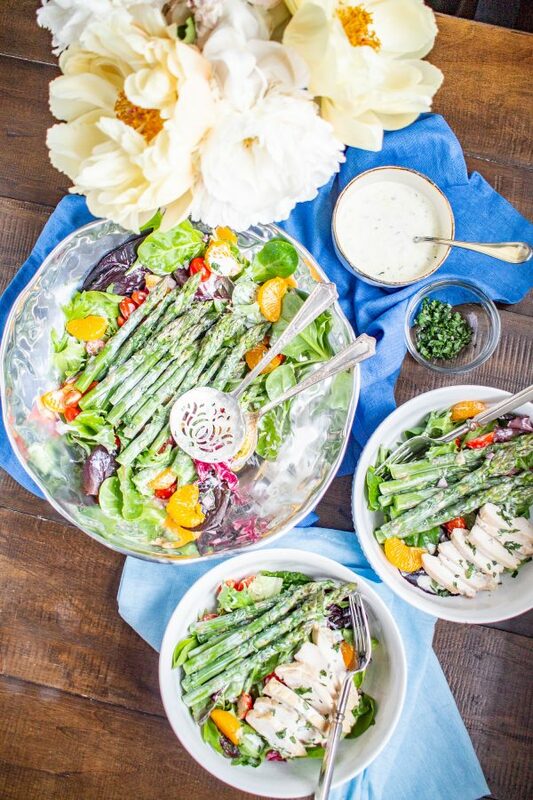 To prepare the salad, blanch the asparagus in salted water for 2-4 minutes. You want the asparagus to still be slightly firm. Drain and place in ice water, set aside. Pour the greens into a large bowl. Top with the mandarin oranges, diced red onion, basil, tarragon, and tomatoes. Lastly, arrange the asparagus on top and drizzle with the dressing. 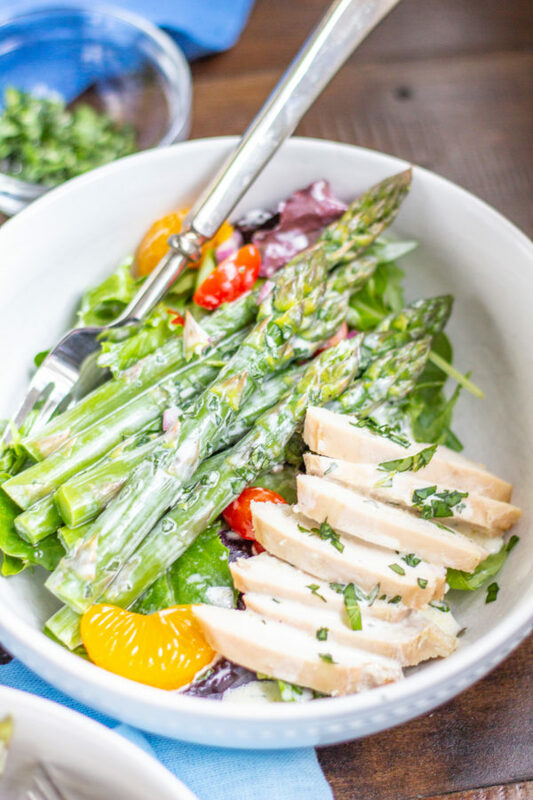 In order to turn this Asparagus Salad into a complete meal, I added some chicken. If I don't have some protein at dinner I don't feel full for very long. Roasted chicken breast paired well with the salad and the dressing. 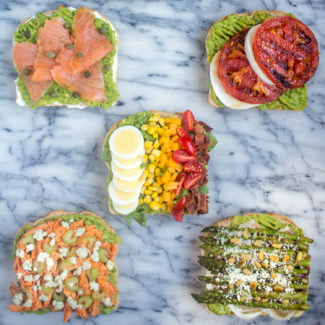 You could also try adding some salmon. 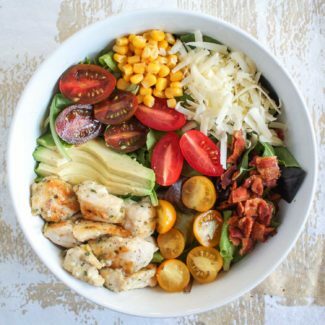 Some other delicious additions to this salad would be slivered almonds or crispy bacon.